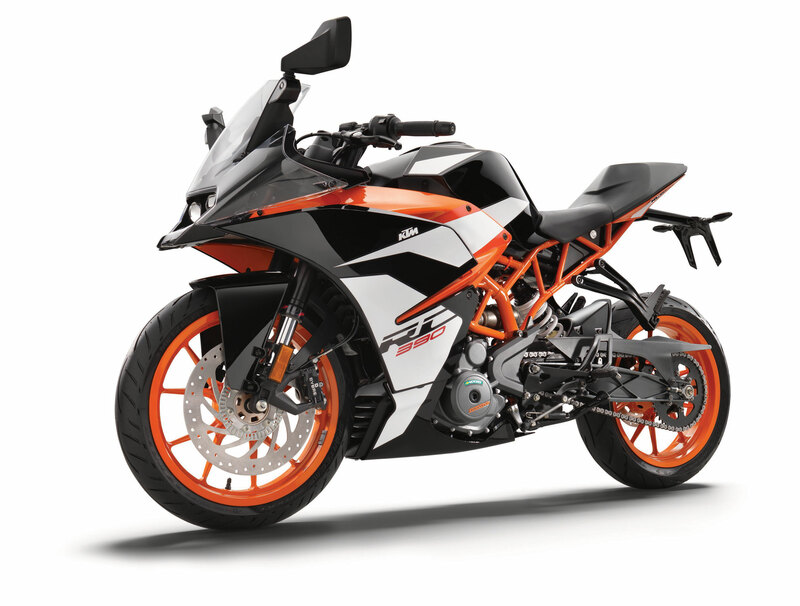 The KTM RC 390’s state-of-the-art, single-cylinder engine with twin overhead camshafts once again underlines KTM’s development strength. Tame the streets with its punchy torque, race the curves with its smooth but impressive power. The KTM RC 390 engine not only delivers bountiful torque and punchy acceleration, but also good manners in everyday use, all with outstanding fuel economy. This lightweight, compact engine really packs a punch and with 32 kW (44 hp) it’s the sportiest option out there for A2 riders. Thanks to the ingenious intake design and the meticulous fuel injection system, the KTM RC 390 is ready to leave the rest of the city traffic behind at the twist of a wrist. The compact, three-chamber silencer is positioned close to the bike’s overall center of gravity. This helps keep the motorcycle centrally balanced and easy to maneuver in the tight and twisty urban streets. 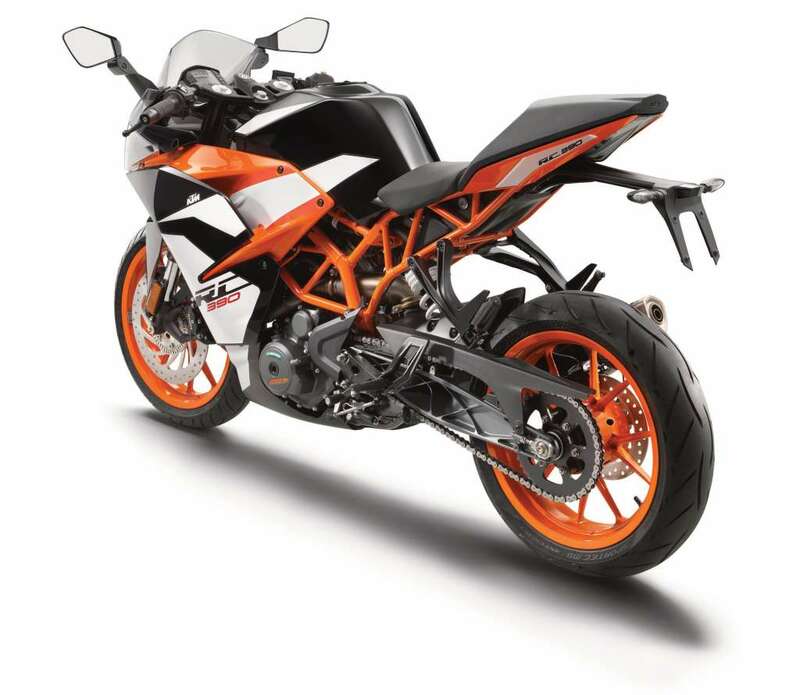 In cooperation with BREMBO, KTM developed a high-tech braking system that works in perfect harmony with the state-of-the-art ABS, allowing riders to always be in full control of their KTM RC 390. 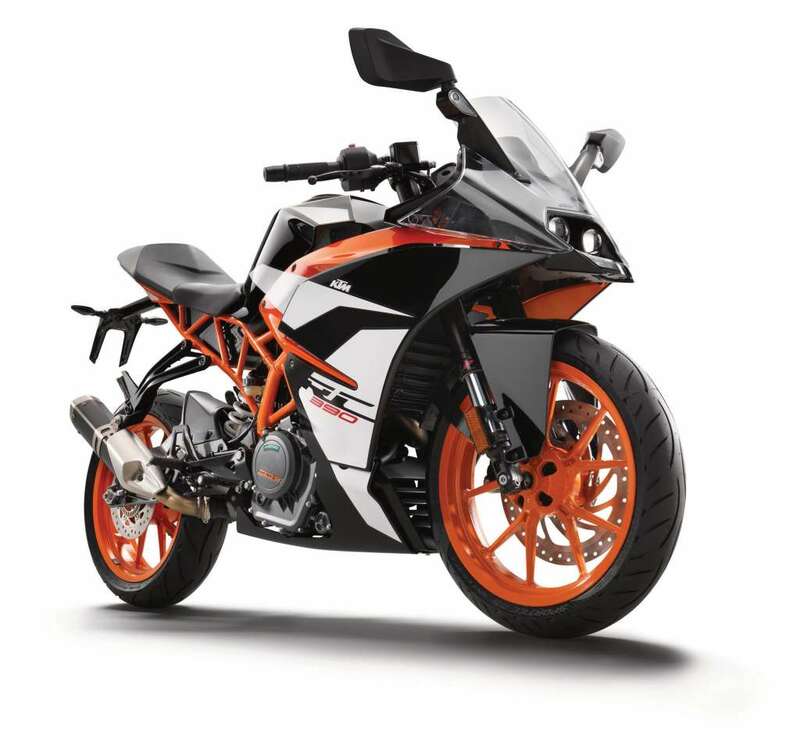 With a four piston radially bolted caliper and a huge 320 mm brake disc on the front, paired with a single piston floating caliper and a 230 mm disc on the rear, the RC 390 delivers exceptional pro-level braking, no matter how hard you’re riding. 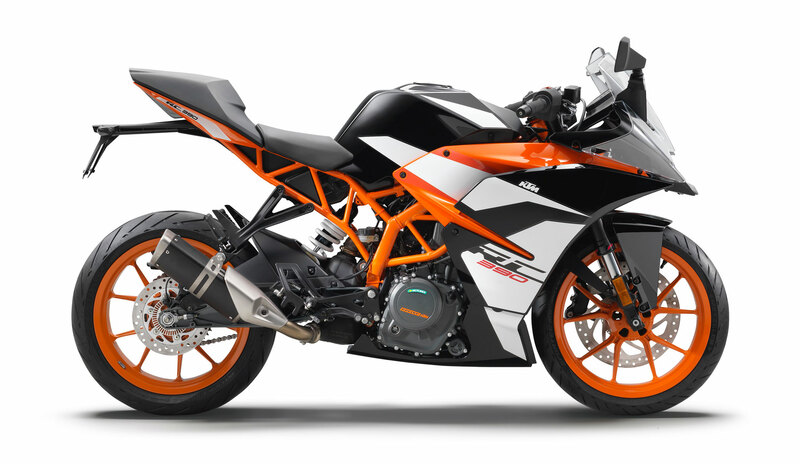 The KTM RC 390 features a sleek, steel fuel tank with a 10 liter capacity (including a 1.5 liter reserve tank). 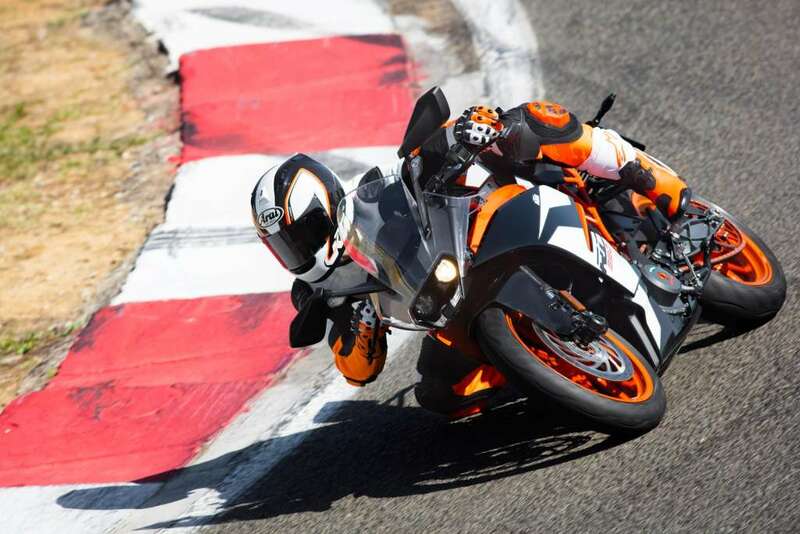 The tank has been developed to perfectly match the supersport style of the KTM RC 390 with smooth rider ergonomics. Thanks to the economic engine, the KTM RC 390 offers considerable range with this tank, even when riding in full sport mode all day long. The clip-on bars and strategically positioned switches contribute greatly to the bike’s sporty and aggressive riding position, whilst also enhancing control for perfect lines through any corner. The two-part seat offers first class, supersport ergonomics with perfect support for both rider and pillion. A seat height of 820 mm enables riders to have a secure position, whilst also being high enough for circuit-style riding. 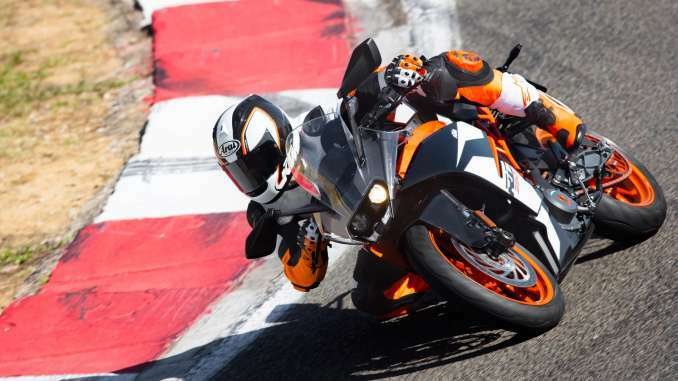 The Pillion seat has been integrated into the bodywork so as not to compromise the supersport look of the KTM RC 390, whilst also ensuring excellent comfort for the passenger. The advanced design of the KTM RC 390’s windshield works with the aerodynamic optimization of the front end to ensure ultimate wind protection for riders who like to open it up on the open road. Crafted from high-grade, CNC-machined aircraft aluminum, these lightweight yet super-strong footpegs offer premium purchase for your feet when you need it most. The pegs are fully customizable with three positions available to accommodate for different rider shapes and riding styles. The powerful twin headlight provides superb visibility in low-light or dark conditions and perfectly matches the modern, supersport race look of the KTM RC 390.